Welcome to the September 2017 edition of the PXI Newsletter. Our intent is to educate and inform you about how the PXI standard is being used in modular test systems for a wide variety of industries. In the New PXI Products section, we are showcasing PXI products recently released by members of the PXI Systems Alliance. 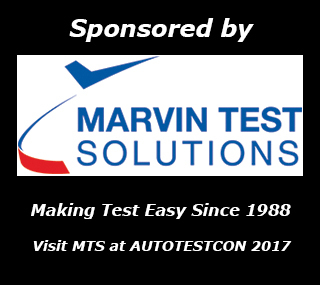 Our thanks go to Marvin Test Solutions, the sponsor of this month's issue. Visit http://www.pxisa.org for more information. Test organizations are transitioning from the status quo of rack-and-stack box instruments and closed-architecture automated test equipment (ATE) systems to smarter test systems. Learn why you should too. Smart devices are creating an inflection point in automated test for both the test managers and engineers challenged with ensuring the quality of these devices at increasingly lower costs, and the vendors that serve them. To test their smart devices, organizations are transitioning from the status quo of rack-and-stack box instruments and closed-architecture automated test equipment (ATE) systems to smarter test systems that scale with escalating requirements to continually shorten time to market and drive down cost. For many of us, the Internet of Things (IoT) has already become a personal reality. When we control our Nest thermostat from a smartphone, measure the number of steps we’ve taken with a wristband, or stream video to a tablet, we enjoy the benefits of a device that can sense, connect, and compute. However, even for early technology adopters, the IoT is still in its infancy. Gartner estimates there will soon be more connected devices than humans, and by 2022 each household could contain more than 500 connected devices. In its day, VXI technology was a definite step forward. Built upon the modular VME computer bus, VME eXtensions for Instrumentation, or VXI, reduced the size and increased the performance of high-end test systems. Instead of bulky rack-and-stack systems, whose instruments were connected by the relatively slow GPIB interface, VXI systems featured modular instrumentation that plugged into a modified VMEbus that provided higher data transfer rates and real-time performance not possible with rack-and stack systems. The VXIbus has served test and measurement engineers well, but it is more than 30 years old now, and it may be time to move to a more modern platform. Today, more test systems designers are choosing the PCI eXtensions for Instrumentation (PXI) platform when designing new modular test systems or replacing or updating existing test systems. Originally introduced in 1997 by National Instruments, PXI is now supported by nearly 70 companies working under the umbrella of the PXI Systems Alliance (PXISA), which publishes the PXI specification and ensures instrumentation interoperability. Thanks to all our readers. The new PXIe-8301 remote control module is the industry’s first solution for laptop control of PXI systems using Thunderbolt 3 technology. Robust 1Amp/20W switching modules, with up to 4,096 crosspoints. Constructed using Pickering Electronics’ new 4mm x 4mm Reed Relay makes this range a new generation of 1Amp PXI matrices with two times the density of any competing large matrix module. Available in 2, 4, or 8-slot PXI sizes and designed for high performance matrix requirements. SignalCore’s high performance triple stage heterodyne 100 kHz to 6 GHz upconverter is cost effective, compact and designed for seamless RF integration. Its output IF frequency can be tuned to center between 100 MHz and 500 MHz, and also selectable for 1250 MHz. Increase your Pre-5G signal generation confidence with the M9383A microwave signal generator that provides 1% EVM @ 28 GHz and up to 1 GHz modulation bandwidth. Generate standards compliant or custom waveforms for emerging wireless, 5G new radio, and aerospace & defense application using Keysight signal Studio or SystemVue software. The high-speed GaGe 16-bit RazorMax Express Digitizer series is now available from DynamicSignals in a new 3U PXIe Gen3 x8 single slot form factor. The 1st and only current available PXIe Gen3 based digitizer providing unprecedented speed and resolution for the latest PXIe Gen3 platform. PA32S provides high-performance analog, digital, counter / timer and I2C / SPI functionalities on a single board; enhances SCAN/SRD modes to save execution time significantly during data log / capture. Tactical and public safety communications continue to advance and has evolved designs to more complex radio technologies. New radio communications technology must address today’s demand for more information, faster, and with increased bandwidth and frequency range. Many engineers are challenged to increase test capability while keeping new test system costs, including instruments and development time, to a minimum. This article provides recommendations to overcome the key radio test system development challenges engineers face. Design and test engineers are challenged to develop radio test systems that address older radio standards as well as create new designs with the most recently developed standards. MilCom (military communication), avionics, and land mobile radio (LMR,) including public safety and commercial radio applications, implement similar architectures and functionalities to ensure the quality and reliability of voice and data communications. Greater design and test challenges are associated with the different analog/digital modulation schemes, increased frequency band, and encryption algorithms for these radio systems. Managing overall test cost requires attention to each phase of radio device development, from R&D, through validation, and manufacturing, to ensure reliable, repeatable test results that correlate to other areas of test, and prevent re-test, or even re-design, when results cannot be verified by R&D.